This page should have 2017 through 2019 Sonic clothes. With the 'Boom Ban' gone, the USA can branch out into modern style Sonic stuff again. Watch for great new stock art (From Sega) to appear on these shirts. Both little and big sizes will likely continue. Little sizes are still ok to collect, even if you don't fit into them, because you can still fit the shirt into a frame if you like the design to make it like a poster. However, it should be noted that Kohls, JC Penny, Hot Topic, and FYE are also getting into carrying Sonic shirts. GKWorld may also be getting into shirts as well! You can also shop at the Sonic Gear Clothing Store. .(Gear store actually has a ton of stuff, about 2 pages of it, but it DOES rotate & sell out. Want to see other modern Sonic clothing items? Use the Sonic Clothing Hub for links to every page of clothing gallery. 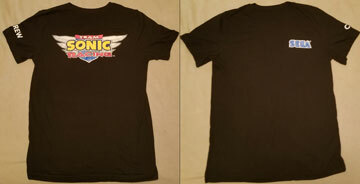 Here is a "Team Sonic Racing" (an upcoming game) tee. This one was seen at PAX and E3 worn by people manning the TSR booth. As you can see, it is labeled with the word "CREW" on one sleeve, making it probably not a 'public' tee, but a company one. 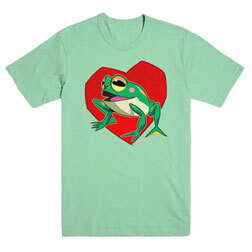 Here's a green tee starring...Froggy? Big the Cat's pet frog most known for accidentally eating a chaos emerald in Sonic Adventure 1 gets a solo shirt, against most of the odds here. It DOES come with an explanation. If you watch the little shorts Sonic 'cartoons' on Youtube, you'll find the Team Sonic Racing ad / mini-show. In it, Eggman tries to trick Big (of Team Amy) into quitting the race by putting up a "Frog Merchandise Stand" with all frog themed items. This tee, and the cap hat are among them. Wacky hi-jinx of course, ensue...but what's even wackier is that the Sega Shop decided to make the tee a real thing. This hat is about FORTY dollars! This tee is about 23 dollars, in adult sizes.Neither one is a bargain, and if you had never seen the mini advertising cartoon for the game, you can't even get the joke. The slice of the Sonic fan population who sees the cartoon, gets the joke, then has the big dollars to spend in the store getting the gag item...can't be imagined to be very large. Is this even going to sell? Isn't the joke from the mini-show that the hat and tee are so silly & wierd that only Big the Cat would ever wear them? Even though it is explained, the whole situation remains strange. And Green. This is a 2019 item.